One evening in early December, 1955, I was sitting in the front seat of the colored section of a bus in Montgomery, Alabama. The white people were sitting in the white section. More white people got on, and they filled up all the seats in the white section. When that happened, we black people were supposed to give up our seats to the whites. But I didn't move. The white driver said, "Let me have those front seats." I didn't get up. I was tired of giving in to white people. 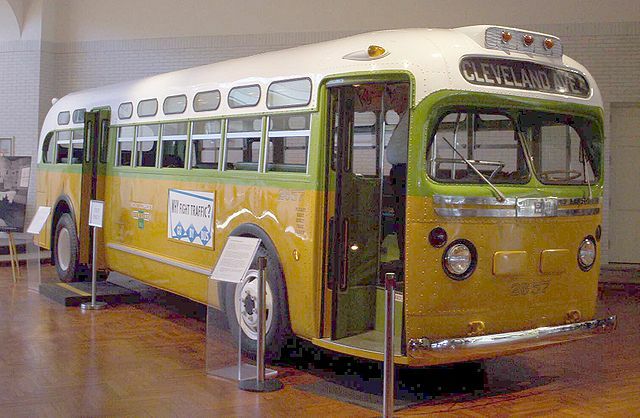 The bus on which Rosa was riding that day is now on display at the Henry Ford Museum, in Dearborn. We can view the exact location of Rosa's seat, thanks to a court record. This image depicts an exhibit from Civil Case 1147, Browder, et al v. Gayle, et. al which was filed, during 1955, in the U.S. District Court for the Middle District of Alabama, Northern (Montgomery) Division. Locate Rosa's seat next to a window, on the right side of the bus, five rows back from the front door. After Rosa Parks defied the law in Montgomery, Alabama - refusing to give up her bus seat to a white man - she was arrested, fingerprinted and convicted after a very short trial. 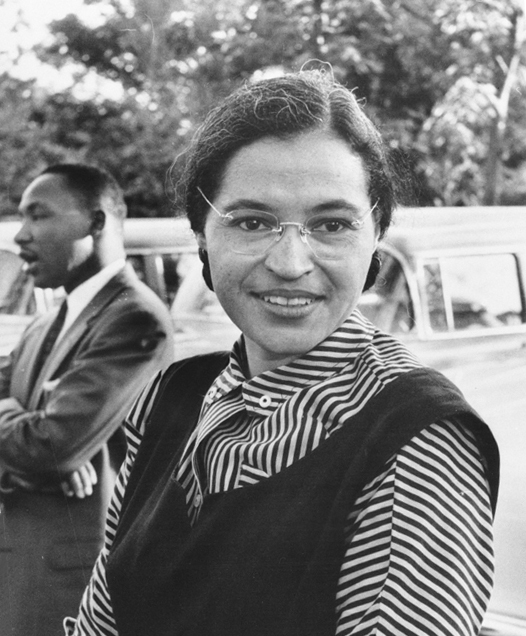 Her actions effectively launched the modern-day civil rights movement. Dr. Martin Luther King, Jr. - not well-known nationally before Rosa Parks was arrested - also rose to prominence as he urged Montgomery's African-American citizens to participate in a bus boycott. That boycott lasted 382 days, ending (in December of 1956) after bus companies, throughout Alabama, had no choice but to change their actions. The U.S. Supreme Court had issued a ruling—in a case called Browder v. Gayle (also known as Gayle v Browder)—declaring that segregation, on all methods of public transport, was illegal. 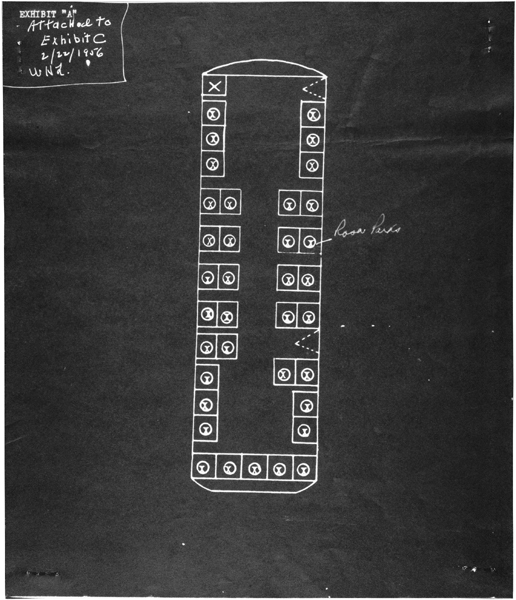 The case, challenging segregated busing, was filed by four African-American young women: Aurelia Browder, Mary Louise Smith, Susie McDonald and Claudette Colvin. The ruling, by the Supreme Court, effectively overturned the high court's decision in Plessy v Ferguson (which led to the Jim-Crow era in America). Dr. King paid for his bus-boycott leadership. On the 22nd of March, 1956, he was convicted under a law (passed in 1921) designed to break actions by trade unions. At the time, the 27-year-old King was convicted of organizing an illegal boycott. Fined $500 for his actions, MLK was also ordered to pay an equal amount in court costs. When his lawyers gave notice of their plan to appeal the conviction, the court converted the fine into a prison sentence of 386 days (which would be suspended until the appeal could be heard). I am Rosa Parks - a book for preschoolers by Rosa Parks with Jim Haskins. Rosa Parks died, at the age of 92, on October 24, 2005. She was the first woman to lie in state in the Rotunda of the U.S. Capitol building. A book released in time to celebrate the 100th anniversary of her birth - February 4, 1913 - explores a lesser-known side of the civil-rights icon. It is called The Rebellious Life of Mrs. Rosa Parks. This video clip is the trailer for the award-nominated "Mighty Times: The Legacy of Rosa Parks." Clip from "Mighty Times: The Legacy of Rosa Parks," copyright Hudson & Houston (studio), all rights reserved. Clip provided here as fair use for educational purposes and to acquaint new viewers with the production. Bos, Carole "Rosa Parks - Mighty Times" AwesomeStories.com. Nov 18, 2013. Apr 23, 2019.